Creating canvas clusters to hang your precious memories and personalize a room is the easiest way to fill empty wall space. You will liven up any room without painting walls or moving furniture. The Family Collection is a great cluster canvas arrangement, perfect for highlighting your family and any favorite moment. Display your collection with a large family photo accompanied by 3 smaller square canvas prints to highlight that special occasion, or to better share your family memories. With many options to choose from, it is a great addition to your home decor or photo wall collection. Here at Mailpix, printing any digital photo to canvas is quick and easy. Simply select the style you want to choose, upload your images and add it to the canvas project you see on the screen. The cluster canvas set will be ready to hang as soon as it arrives to your door. 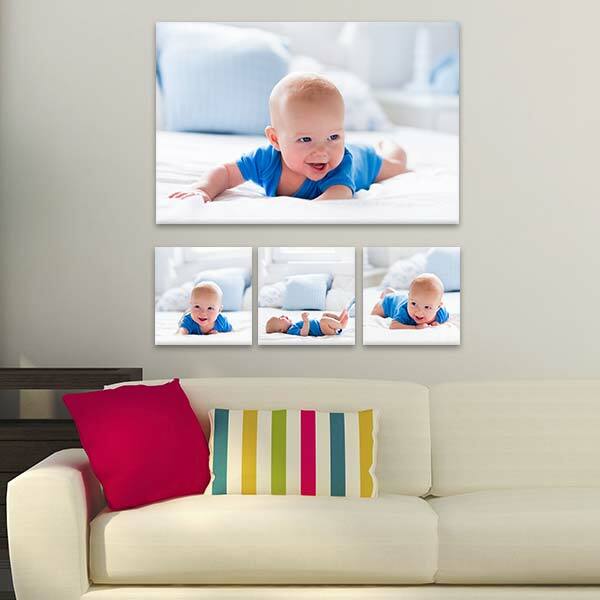 Display your favorite vacation memory on the large canvas and the gorgeous smiles you shared on the smaller canvases. When enjoying the moments you share with family, it can be fun to snap a few fun pictures to remember the good times. Yet, taking pictures shouldn’t mean they stay in your phone or camera until you rediscover them again. Deciding to print your favorite digital photos on canvas will liven up any room with smiles and cherished memories that your family shares together. The professionally wrapped canvases are a charming addition to every room in your home. Your photos can wrap around the edges to give the canvas depth, or printed just on the front side of the canvas with an optional neutral colored edge. It’s easy to forget about a specific moment in time with the day to day activities our lives can get filled with. Every special moment can be saved when taking pictures with your digital camera or phone. Since moving towards digital photography, it has been easier to store our images on the cloud or even on your computer with just a few clicks and the push of a button. At Mailpix, we don’t want you to put all your pictures away where they are unseen and unappreciated. Finding your favorites and printing them on beautiful gallery wrapped canvas prints preserves those memories and brings them back to life every day. Take the family outdoors for a day in the sun! Snap a few pictures of the precious smiles you adore. A beautiful family photo is perfect to print on the large 24x36 canvas. The 3 smaller square canvases can be printed with any of those adorable candid pictures you got of the kids enjoying the outdoors. You can even use the smaller ones to display your kids first baby pictures. If you don’t have three kids, take a picture of his precious face, tiny baby hands and adorable feet! There are so many occasions throughout the year. Take these opportunities to capture pictures of your family and friends. With everyone all dressed up and looking their best, getting the perfect shot is just a smile away. Snapping a few pictures can turn into a memorable moment that will last for years to come. Get the kids to smile with grandma and grandpa. Seek out the perfect moment of the kids playing out with family and friends. Any way you decide to gather around for a photo, you will cherish the moment forever. You might also have a collection of pictures from birthdays, Mother's Day, Thanksgiving and so many other holidays. Get them printed to canvas to preserve those moments for many years to come! The larger 24 x 36 canvas is perfect to print a full family photo and the smaller 10x10 canvases are perfect for printing those close up silly faces. You may even want to use The Family Collection to print your wedding and engagement photos! Get the large canvas printed with your favorite picture of just you and your new spouse. The smaller three canvases can be used to show the fun times that you created together on your journey thus far. 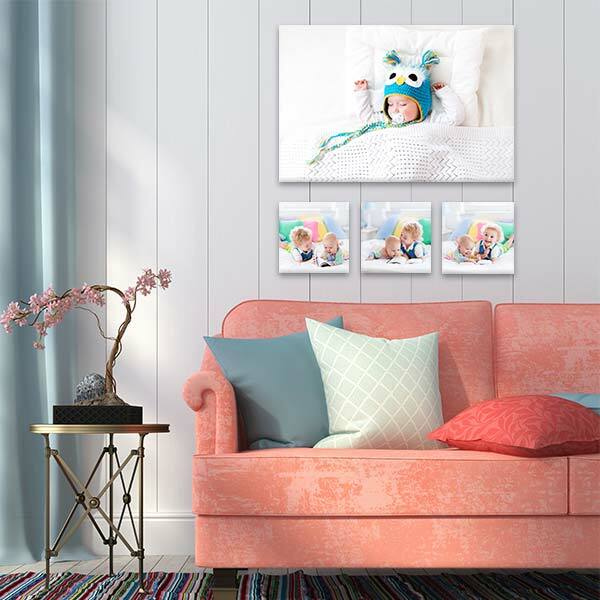 If you prefer the idea of four canvas prints of the same size, our Cube canvas cluster is another great option for showing off any series of family photos in style. You have gathered the family and arranged an appointment for a professional photo shoot. You are now faced with deciding how to display your beautiful photographs on your walls. Creating a family photo arrangement is easy to do with The Family Collection. The whole family will be perfect to display on the larger canvas, while the smaller canvases are just the right size for individual shots. You may even want to let the photographer know how you plan to arrange these so your photos print flawlessly. Printing your digital pictures to canvas couldn't get any easier. When you print those precious smiles and memories to canvas you will be able to share them with anyone who comes by to visit. Reliving the moments you share with family and friends will bring those good feelings and emotions back. It is also a great way to show them you care and adore every moment with them. Includes three 10x10 Wrapped Canvases and one 24x36 Wrapped Canvas which can be hung in any orientation. Decorating doesn’t have to be something you’re good at to add color and warmth to your home. If you love decorating with canvas, The Family Collection is a versatile arrangement that can be used to display either a large Vertical canvas, or Horizontal canvas photo. The three smaller canvases can be hung on the sides for the perfect layout. This makes it an ideal arrangement for any home, whether you are a photo decor enthusiast or not. With many options available to expand the arrangement, how creative you choose to be is up to you. Need a thin lightweight canvas to display those precious moments on the night stand? Checkout our Canvas Lites! Perfect for the compact spaces of your end tables, night stands or mantelshelf these canvas minis are easily assembled. Adhered to a flexible backing, your favorite moments will stand anywhere you need an extra personal touch. If you need to add some color to a large empty wall space or completely transform a room, you might want to look into a large fabric Wall Mural, which can also be used as a photography backdrop. Large and measuring 96"x 96", this stunning backdrop wall mural is the perfect way to turn any room or basement into a beautiful, relaxing space.